Everyone knows that dogs love to chew bones. Not only does this help to keep your dog entertained and reduce any destructive urges, it also helps to keep his teeth clean, as well as satisfying a powerful natural instinct. 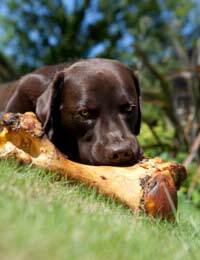 Many owners, however, worry about the dangers of giving their dogs bones to chew. How can you know which types of bones are safe? Many anti-bone people have told horrifying tales about the risks of bone splinters perforating the gut, bowel or small intestines, or lodging in the jaws and becoming wedged in the throat, not to mention cracking and breaking teeth. However, gnawing and grinding on bones is also one of the best ways of keeping a dog’s teeth clean, without which your pet can develop gum disease which can lead to life-threatening conditions such as systemic blood poisoning and organ failure. So what should a pet owner do? The answer lies in balancing the risks. First, it must be understood that nothing in life comes without risks. Therefore, it's certainly true that giving your dog a bone lays him open to potentially injuring himself in the ways described above. No one can guarantee that it won’t happen. However, no one can also guarantee that he won’t injure himself another way either. Dogs have been known to choke on soft food, too. Nevertheless, you can minimise the risks by only choosing certain types of bones for your dog to chew. The most important thing to remember when feeding natural bones is to always choose RAW bones – NEVER COOKED. This is because cooked bones are much more likely to splinter and break into sharp sections, causing injury to the dog. Raw bones, on the other hand – depending on the size and type – can often be soft enough to be crunched up safely and chewed and swallowed without any harm coming to the dog. Naturally, raw bones will require the usual common sense hygiene practices when dealing with raw meat. When searching for raw bones to give your dog, look for the 'knuckle ends', such as the ends of beef marrow bones. It is these ‘knobbly’ ends which provide the best shape and softly abrasive surface for cleaning teeth as the dog gnaws and chews on them. For very small and toy breeds, oxtail bones are often a good bone to chew on. Avoid the middle sections of leg bones – the straight middle section of the 'marrow bones' – as these are extremely hard and therefore more likely to crack your dog’s teeth. They are also hollow and contain marrow, which, while delicious, is very rich and can give many dogs an upset stomach. For those who are really worried about giving raw bones, there are plastic alternatives available, that provide a hard, abrasive surface against which dogs can chew and clean their teeth. These are often shaped like a traditional bone, with 'knuckle ends', although they now also come in a variety of shapes and sizes, with different protrusions to appeal to different dogs. One of the most popular and well-known brands is Nylabone, although there are now many other brands producing similar products. These ‘bones’ are usually impregnated with certain flavours to entice your dog and encourage him to chew them. Alternatively, you can also help things along by smearing a bit of peanut butter or Marmite on the ends. As your dog chews these plastic bones, they will become deformed and small slivers of plastic may be chewed off. These are designed to be safely swallowed by your dog, but if you notice that your plastic bone has become very chewed and deformed, it may be best to throw it away and invest in a new one. In general, the many 'teeth-cleaning' treats on the market are not really effective in removing tartar and plaque build-up. They may help slightly in being harder to chew than soft treats, but their value probably lies more in pleasing the human owners than helping the dog clean his teeth. For effective removal of any plaque and tartar build-up on the teeth, your dog will need to grind and gnaw and essentially ‘rub’ his teeth along a hard enough, abrasive surface to make any difference.